Opening Reception 5 - 8 pm 14th of January 2013. 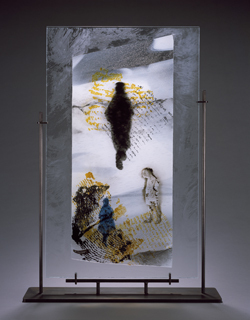 L'Dor Vador: from Generation to Generation by Nancy Current is a series of figurative paintings on glass and paper in which fragments of ancient scrolls and genizah writings are metaphors for Jewish religion and culture which has been passed down for thousands of years. Painting, drawing and printing simultaneously on both glass and paper, Current freely adapt glass painting and printmaking techniques, which then become a literal expression of her investigation into the evolution of Jewish traditions. For images and more info click here.